South Africa’s number one ranked junior Jayden Schaper leads the first round of the African Amateur Stroke Play Championship at Leopard Creek; credit Ernest Blignault. 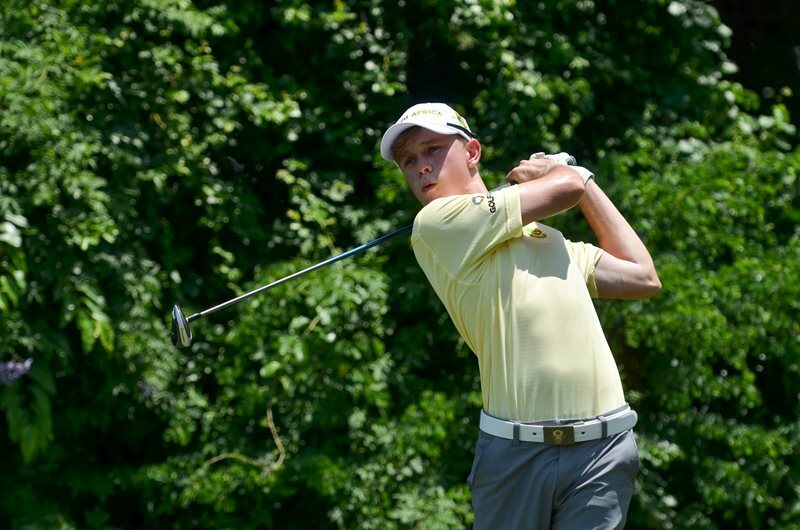 GOLF NEWS - South Africa’s number one junior Jayden Schaper showed some serious big match temperament to surge to the top of the leaderboard on day one of the African Amateur Stroke Play Championship at Leopard Creek Golf Club on Monday. Schaper brought some hot form to the African Swing opener in Mpumalanga and set the first round mark with a solid three-under-par 69. A season-opening triumph in the Free State Open propelled Schaper to sixth in the Open Amateur Rankings and he cemented his number one spot in the Junior Rankings with victory in the Nomads National Order of Merit at Benoni Country Club. The 17-year-old GolfRSA National Squad member backed that up with his second Bridge Fund Managers Junior Series win at ERPM. Schaper followed a birdie-birdie start with a lone bogey at fourth and pushed clear of the chasing pack with a birdie finish at the par-five closing hole. “It was a very solid first day and I made very few mistakes,” said the Ebotse golfer. “I only dropped that one shot, but those are the breaks. I hit my tee shot at four little left and caught the fairway bunker. The ball was sitting down proper, but I managed to duff it out. The pin was in a tough spot, but I got on the green and then my par putt lipped out. Schaper holds a one-shot lead over Ludwig Aberg from Sweden, former SA number one Garrick Higgo and fellow Ekurhuleni junior Ryan van Velzen. Aberg – currently 90th in the World Amateur Golf Rankings – got it to four-under with two pairs of birdies on the front, but lost the advantage with a double bogey at the par four 10th. He dipped three under par with a gain at 15, but gave the shot back with another drop at 17. Back competing on home soil after a year-long season at the University of Nevada Los Angeles, Higgo from Boland mixed three birdies with a lone bogey at 11. Making the most of his early start, 17-year-old Van Velzen was level through 16 holes before he sunk to five-footers for a birdie-birdie finish and a share of second. Martin Vorster from Southern Cape was the only other player to finish in red numbers. The reigning Junior Open champion made three birdies on the bounce from the sixth to turn two-under, but a costly double at 11 had him back at level par. The 17-year-old from Mossel Bay rallied with a birdie at 17 for a one-under 71. Gaelen Trew from Scotsland recorded the first ace of the championship when he holed out with an 8-iron from 169 yards at the par three eighth. The Gloucestershire golfer tied for sixth with Germany’s Lukas Buller, Scotsman Euan Walker and South African pair Karabo Mokoena and Francois Blaauw. Thanks to Schaper and Vorster’s efforts and a five-over 77 from new cap Sam Simpson from Western Province, the GolfRSA Juniors made a great start to their title defence and lead the 54-hole Team Competition by two shots on one-over 2017. Sweden and Germany tied for second, with two-time champions Scotland third on eight-over. England and India are a further shot adrift, and the GolfRSA Seniors moved into seventh place on 13-over. France, Reunion and Mauritius respectively finished eight to 10.